Contains contributions by experts from various disciplines that reflect current trends and controversies on judgment and decision making. 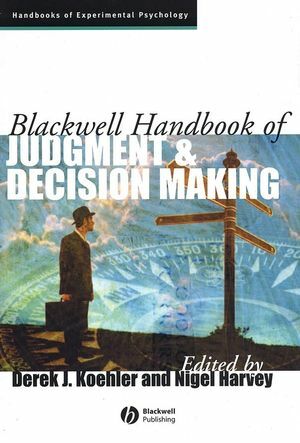 Provides a glimpse at the many approaches that have been taken in the study of judgment and decision making and portrays the major findings in the field. Presents examinations of the broader roles of social, emotional, and cultural influences on decision making. Explores applications of judgment and decision making research to important problems in a variety of professional contexts, including finance, accounting, medicine, public policy, and the law. Derek J. Koehler is Associate Professor of Psychology at the University of Waterloo, Canada. He recently completed a term as associate editor at the Journal of Experimental Psychology: Learning, Memory, and Cognition. Nigel Harvey is Professor of Judgment and Decision Research at University College London. He is a member of the Centre for Research into Economic Learning and Social Evolution and is a former president of the European Association for Decision Making. 1. Rationality and the Normative/Descriptive Distinction: David Over (University Of Sunderland). 2. Normative Models of Judgment and Decision Making: Jonathan Baron (University Of Pennsylvania). 3. Social Judgment Theory: Applying and Extending Brunswik’s Probabilistic Functionalism: William M. Goldstein (University Of Chicago). 4. Fast and Frugal Heuristics: The Tools of Bounded Rationality: Gerd Gigerenzer (Max Planck Institute For Human Development). 5. Yet Another Look at the Heuristics and Biases Approach: Gideon Keren (Eindhoven University Of Technology) And Karl H. Teigen (University Of Oslo). 6. Walking with the Scarecrow: The Information-Processing Approach to Decision Research: John W. Payne And James R. Bettman (both Duke University). 7. Computational Models Of Decision Making: Jerome R. Busemeyer (Indiana University) and Joseph G. Johnson (Miami University). 8. Inside and Outside Probability Judgment: David A. Lagnado (University College London) and Steven A. Sloman (Brown University). 9. Perspectives on Probability Judgment Calibration: Dale Griffin (University Of British Columbia) and Lyle Brenner (University Of Florida). 10. Hypothesis Testing and Evaluation: Craig R. M. Mckenzie (University Of California, San Diego). 11. Judging Covariation and Causation: David R. Shanks (University College London). 12. A Tale of Tuned Decks? Anchoring as Accessibility and Anchoring as Adjustment: Nicholas Epley (University of Chicago). 13. Twisted Pair: Counterfactual Thinking and the Hindsight Bias: Neal J. Roese (University Of Illinois). 14. Forecasting and Scenario Planning: The Challenges of Uncertainty and Complexity: Paul J. H. Schoemaker (University of Pennsylvania). 15. Expertise in Judgment and Decision Making: A Case for Training Intuitive Decision Skills: Jennifer K. Phillips, Gary Klein, and Winston R. Sieck (all Klein Associates). 16. Debiasing: Richard P. Larrick (Duke University). 17. Context and Conflict in Multiattribute Choice: Eldar Shafir (Princeton University) and Robyn A. Leboeuf (University of Florida). 18. Internal and Substantive Inconsistencies in Decision-Making: Christopher K. Hsee (University of Chicago), Jiao Zhang (University of Chicago), and Chen Junsong (China Europe International Business School). 19. Framing, Loss Aversion, and Mental Accounting: Dilip Soman (University of Toronto). 20. Decision Under Risk: George Wu (University Of Chicago), Jiao Zhang (University Of Chicago), and Richard Gonzalez (University of Michigan). 21. Intertemporal Choice: Daniel Read (University of Durham). 22. The Connections between Affect and Decision Making: Nine Resulting Phenomena: Yuval Rottenstreich And Suzanne Shu (both University of Chicago). 23. Group Decision and Deliberation: A Distributed Detection Process: Robert D. Sorkin, Shenghua Luan, and Jesse Itzkowitz (all University Of Florida). 24. Behavioral Game Theory: Simon Gächter (University of Nottingham). 25. Culture and Decisions: Incheol Choi (Seoul National University), Jong An Choi (Seoul National University), and Ara Norenzayan (University of British Columbia). 26. Behavioral Finance: Markus Glaser, Markus Nöth, and Martin Weber (all University Of Mannheim). 27. Judgment and Decision-making Accounting Research: A Quest to Improve the Production, Certification, and Use of Accounting Information: Natalia Kotchetova (University of Waterloo) and Steven Salterio (Queen’s University). 28. Heuristics, Biases, and Governance: Jeffrey J. Rachlinski (Cornell Law School). 29. The Psychology of Medical Decision Making: Gretchen B. Chapman (Rutgers University). 30. Judgment, Decision Making, and Public Policy: Nick Pidgeon (University Of East Anglia) and Robin Gregory (Decision Research, Vancouver). "....Exactly what a good handbook should be; comprehensive, representative, authoritative, authentic and well-written"
"This spelendid collection by Koehler and Harvey is a timely state-of-the-art report on Judgment and Decision Making (JDM) and provides a good demonstration of the great strides that have been made in thie area over the past 50 or so years. In short, for anyone who wants to know exactly where JDM research is currently at, this book is essential reading." "The Handbook shows the realization of Ward Edwards's original dream of a field made exciting by the continual interplay between normative analyses, descriptive research, and prescriptive interventions, bridging critical gaps between the normative ideal and descriptive reality." "Fifty years of research have created an impressive body of knowledge and theory about human judgment and decision making. This comprehensive and authoritative handbook will serve as a valuable text and reference for students, scholars, and decision makers." "This is the first book to give a complete overview of this field, which has been developing since the 1950s. The first part details normative approaches and includes discussions of bounded rationality and computational models of decision making. The next two parts focus respectively on judgements and decisions while the last part examines practical applications. Topics range over hypothesis testing, the challenges of uncertainty and complexity, the role of feelings in decision making, the influence of culture and even the psychology of medical decision making." explores applications of judgment and decision-making research to important problems in a variety of professional contexts, including finance, accounting, medicine, public policy, and the law.